Now the characters in this game are totally up my alley! Vampires and Zombies oh my! Though it wasn't quite what I expected, I was completely addicted to finishing it. Control vampire forces to fight back a zombie invasion in Vampires vs. Zombies, a zany Time Management game! As drooling zombies descend on Transylvania in the hopes of munching on vampire brains, you must rally the forces of darkness to create the weapons you'll need to repel the attack. The stakes will be high as you harvest goods, sell them, and use your profits to produce implements of battle, but the Count believes in you! 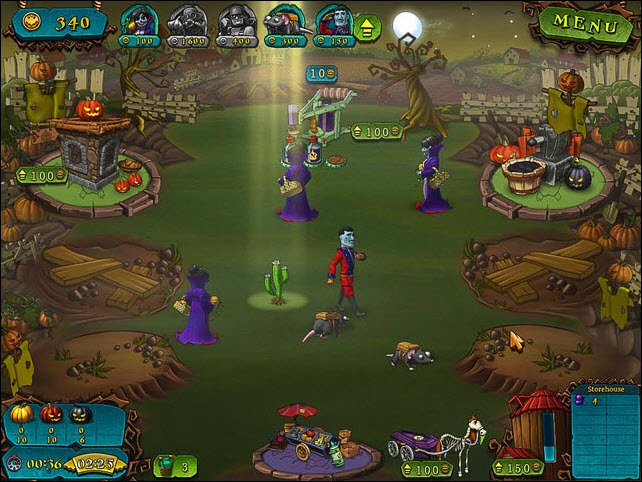 Rally the forces of darkness, Create incredible weapons, Stop a zombie invasion!